City crews were literally greening Los Angeles streets over the past weekend. Stretches of Boyle Height’s First Street and Downtown’s Spring Street received bright green pavement coloring. Though pavement color has been used in Europe, and various U.S. cities, including New York, San Francisco, and Long Beach, these two projects represent the city of L.A.’s first foray into colorization. 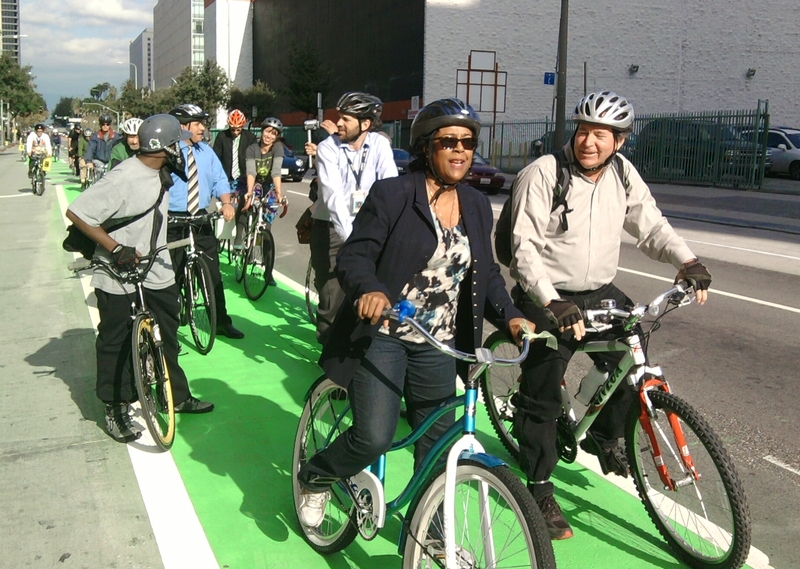 The Spring Street green buffered bike lane was celebrated at a press conference yesterday afternoon. Councilmembers Jan Perry and Jose Huizar praised the new lanes and the safety and visibility they bring. LADOT’s Tim Fremaux acknowledged the city council, mayoral, departmental, and community work that had gone into the rapid implementation of this project, inspired by Dutch planning ideas explored at the recent ThinkBike event. The Downtown L.A. Neighborhood Council’s Valerie Watson thanked businesses and residents for supporting the effort to convert Spring “from a raceway to a neighborhood street” and looked forward all the additional bike facilities approved for Downtown in the city’s Bike Plan and its 5-Year Implementation Plan. The L.A. County Bicycle Coalition’s Jen Klausner rounded out the program urging politeness among all road users from drivers to pedestrians to bicyclists. Downtown’s green lane is on Spring Street, extending 1.5 miles from Cesar Chavez Avenue to 9th Street. The lane is 6-feet wide, with a 4-foot buffer. To create space for the bike lane, one traffic lane was removed and one peak-hour parking lane was made into an unrestricted parking lane. 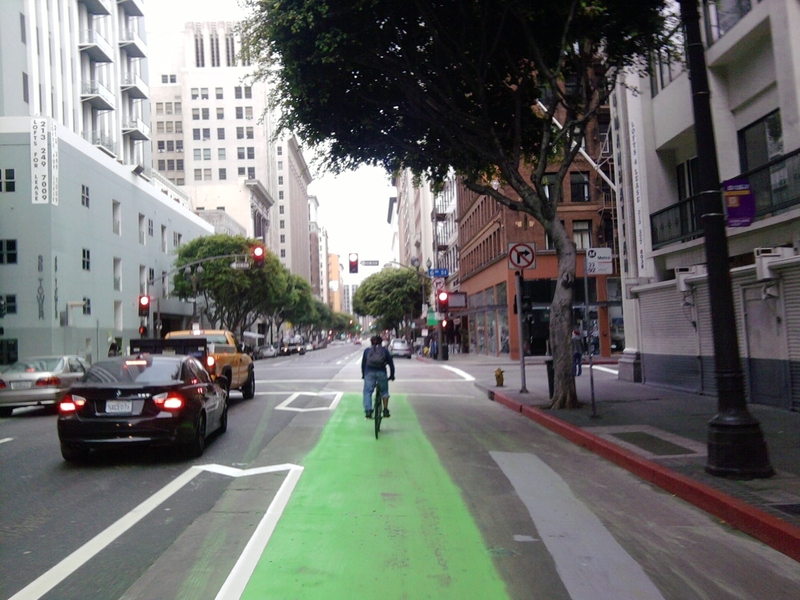 The Spring Street lane is painted with green paint. The paint is continuous for the entire length, other than in merge zones, where it becomes intermittent. Unfortunately, perhaps due to the paint not fully setting during the past weekend’s wet weather, in some places the paint is already wearing off. This is the first LADOT project using this roadway paint, so they’ll be finding out what works well and what doesn’t. 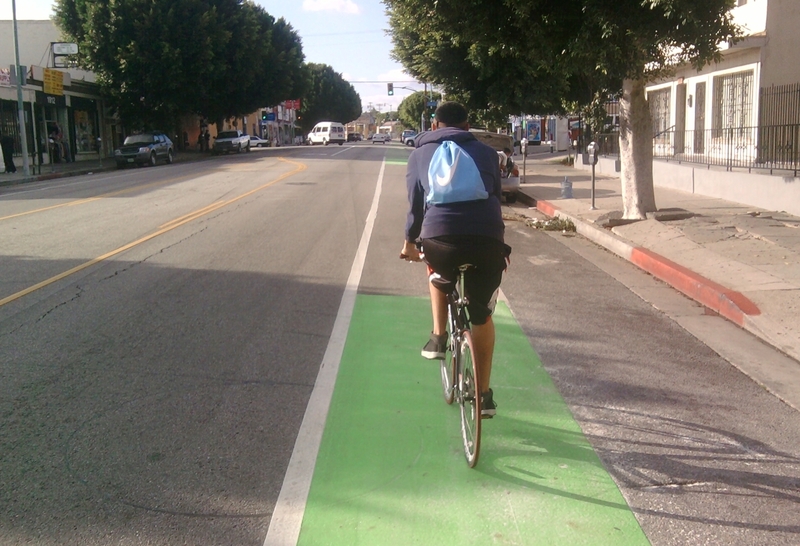 Boyle Heights’ green lanes are on First Street, extending 1.6 miles from Lorena Street to Boyle Avenue. The First Street green lanes differ from the Spring Street ones in a couple ways. On First Street, green has been used only in conflict areas, including driveways, alleys, turn zones, and at the beginning of each block. The First Street project uses green thermoplastic instead of paint. Nearly all of the striping and other markings on L.A. streets use thermoplastic, which is essentially a very durable, long-lasting form of paint. Thermoplastic is more expensive than paint, and lasts much longer. L.A.’s streets are looking a little greener than they used to. Helmets on politicians inspire confidence…..
And when they want to turn left, younger and inexperienced cyclists… what do they do? Sit somewhere on the right and cross like pedestrians, or try to cross traffic? At least some people have jobs painting stuff. @facebook-591313105:disqus Joe Linton, thanks, I know that. As they say in transport engineering circles in the Netherlands, borrowing an Americanism “Het is bogus”. It is so good to see that the ThinkBike workshops gave a boost to implementing these green lanes. Keep up the good work LA!!! To be fair, it’s one BUS lane (off peak parking) and one traffic lane that was removed to create the bike lane, as evidenced from a Google street view. So now there’s parking there all day, a bike lane (taking up the space of a car lane), and two through travel lanes (three if the left side parking is banned, which it is intermittently).